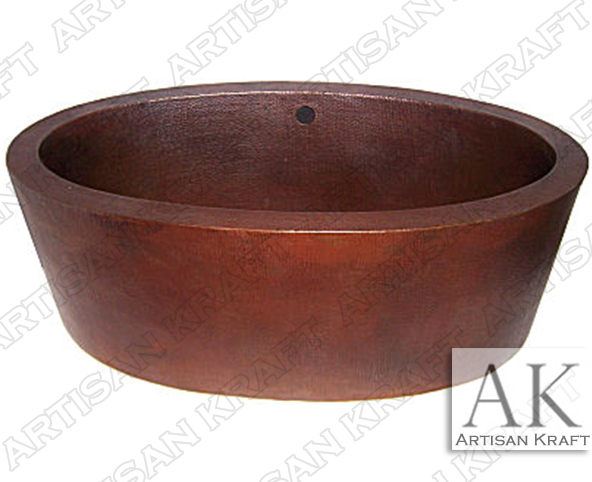 A large Double Ended Oval copper bathtub that has a hammered interior and exterior finish. The hammered finish has a bumpy feel. It’s lots of little divots that are more or less the same size. This can also be made in a smooth finish. The overflow drain is built into this copper bathtub which is not very common. This big soaking tub can fit two people inside. Like more of our copper bathtubs it is a freestanding design. While it is very large in dimensions it is lightweight. This makes it easy to ship to New York or Massachusetts. The copper color has a Sedona Arizona color with a rich metallic red undertone.